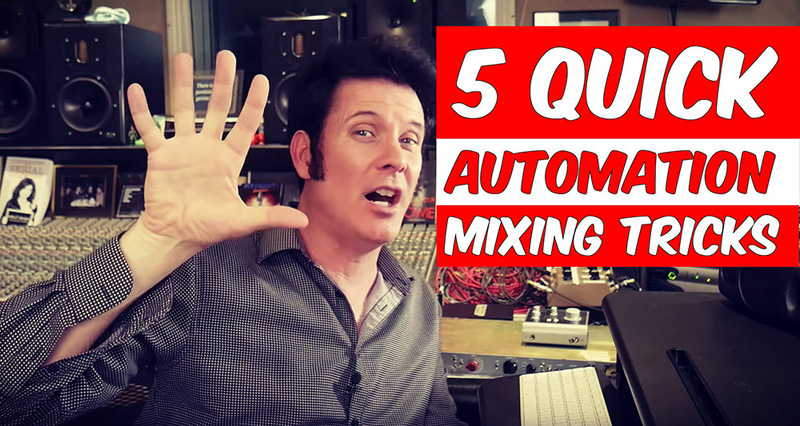 Automation is the secret to a truly great mix! Simple volume automation of instruments can save the heartache of trying to replicate dynamics with complex compression techniques. Automating plug ins can give them multiple purposes adding both subtle ear candy and huge drama to your mixes! Often Drummers, when playing very fast articulated parts, like double kicks, play softer. Go to those sections and do Volume automation to keep the energy up. Simple Volume automation on any instrument can save a lot of time instead of creating complex parallel compression that don’t always get the desired result. We often find ourselves getting tied into knots flattening everything out with a multitude of compression when just spending a few minutes riding the volume will get a better and more natural sounding result. Automating plug ins, like a Transient Designer can make a huge difference with your Drums. Choruses traditionally (with some notable exceptions) get louder and fuller. Simple volume rides on live drums, pushing the volume of the Kick and snare and adding more reverb or room sound to them, brings the energy of the drums up to match the increased intensity of the Chorus. Try using using a Transient Designer to decrease the sustain of a kick drum when a very fast kick part is played. Also increasing the attack of a fast played soft kick drum will help articulate it in the mix. Turn the plug on and off where needed and/or increase the attack and sustain where needed. One of my favourite tricks of many 70’s Albums is where the track begins to fade, however the reverb seems to grow, making the artist feel like they walking away from us! Take your reverb send and set it to pre fade, this will allow you to fade the instrument down and have the reverb remain. It’s a great trick on the end of vocals or guitar solos! Great for last words of songs or transitional moments. Simple Volume and Reverb Automation Swells can exaggerate and add drama to your mix. A single snare hit before a chorus with an increase of reverb adds excitement creating a great difference sonically between sections. You can increase the decay time of a reverb to increase the impact of that snare hit. Setting up a delay in time with the song, 1/4, 8th notes etc is great to have available for ANY instrument. For instance you can pick a word from the lead vocal you wish to exaggerate and then automate a send to the delay, giving that word(s) increased effect, the same could be done with a guitar lick or drum fill!